We’re now in Malaysian Borneo (Bako National Park in Sarawak), with the sound of waves on the beach, evening light glowing and a balmy sea breeze coming in from the South China Sea. 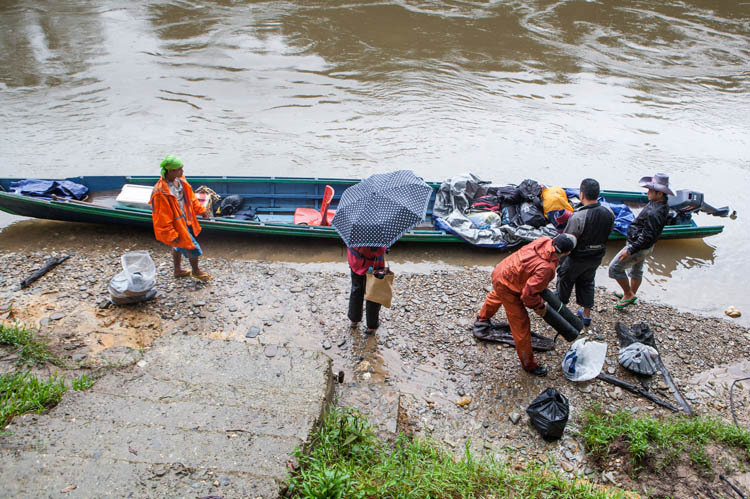 It’s hard to believe that just last week we were still deep in ‘Heart of Borneo’ country – the upper reaches of the Kapuas River in West Kalimantan. The Kapuas is actually the longest river in Indonesia (and is not to be mixed up with the large but quite different river of the same name, which confusingly is also in Borneo!) 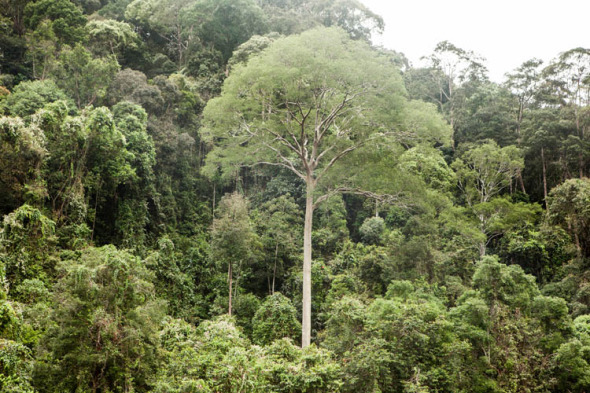 From the Muller Mountains in the middle of the island, it snakes its way westward, all the way down to Pontianak, through depleted forests, oil palm plantations, villages and farmlands. 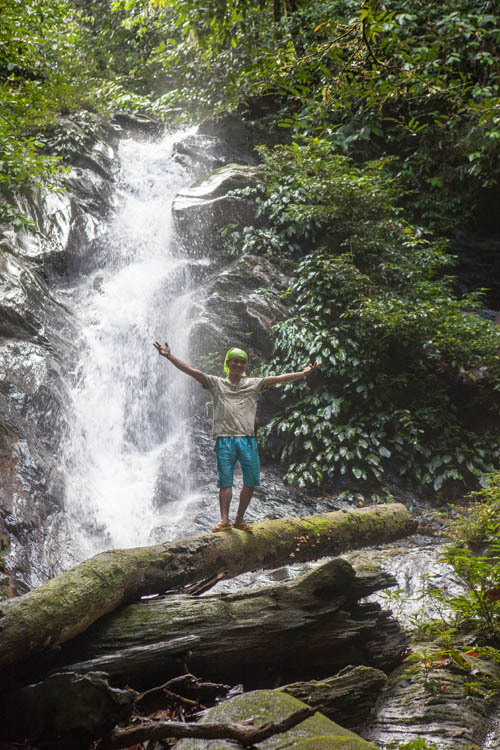 Up near its source in the Muller Mountains, there are five large-ish tributaries which run down into the Kapuas from the remote mountains along the Malaysian border. The area has been designated as the Betung-Kerihun National Park. It’s managed as a wilderness region (with no road access or other infrastructure), and it gives a good idea of what much the island must have looked like in the not-too-distant past. As the saying goes, getting there is half the fun. We flew to the regional capital of Putussibau, where we were met by Mustar and Syarief, two lovely Melayu guys who are both senior rangers in the Park. Lunch in a local restaurant, where there was just enough phone signal to get progress scores in the World Cup Cricket final which was under way at the time. (Have you ever tried to explain the nuances of cricket to people who’ve never seen the game played?) Then a couple of hours driving northwest over wildly variable roads (not all as good as the one above!) to Mataso where we stayed the night in a losmen. 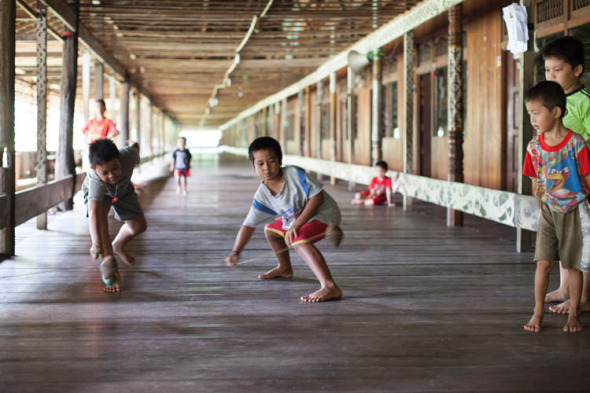 Like everywhere in Indonesia, there is a fascinating and complex mix of ethnicity in the region. the original people (well, oldest group still in existence) are the Dayak Taman. Like the Dayak Iban people, who arrived only in the last hundred years from across the border in Sarawak, they still often (mostly?) choose to live in communal longhouses (betang), often 200 metres or more from end to end (that’s probably why they’re called ‘ longhouses’.) 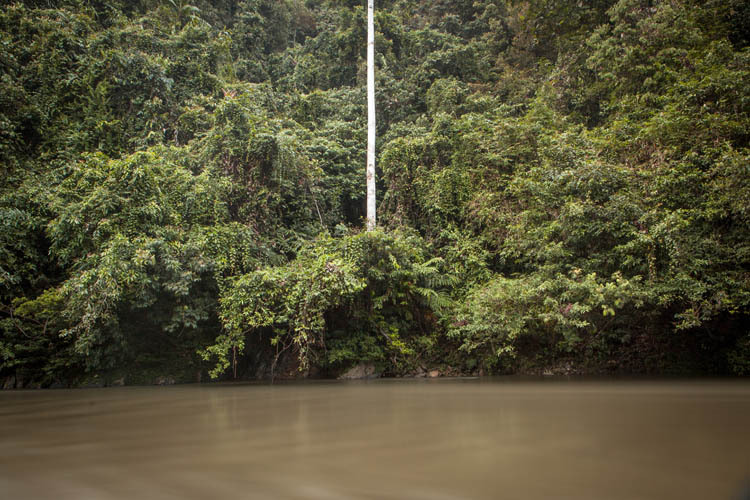 The Iban and Taman are now almost all members of the Catholic Church, but there are rich veins of animism and other traditional beliefs and ritual practices, running just below the surface. 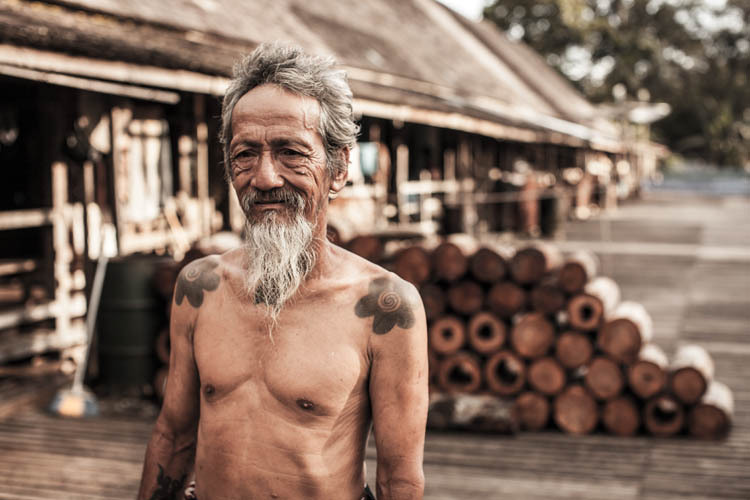 Apay Janggut – “Bandi” – is the traditional cultural leader at the Sungai Ukit longhouse. He spent some time trying to explain to me the meaning and significance of the terung (eggplant) flowers that were tattooed onto his shoulders when he was 15. 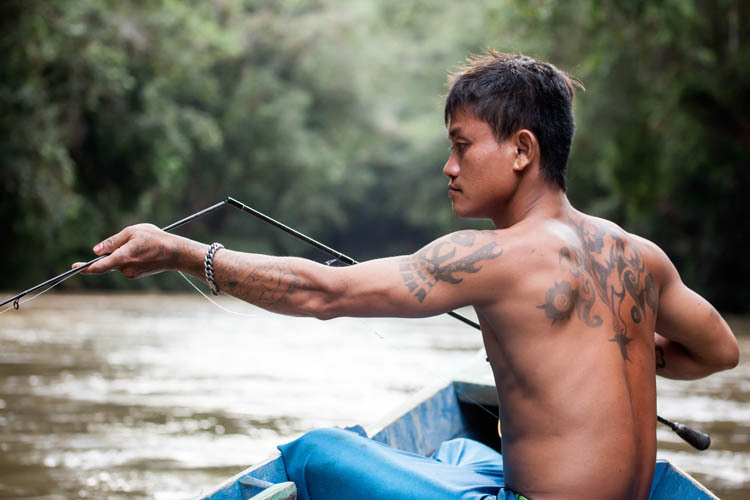 (My limited Bahasa made it difficult, but it’s something to do with the five petals, and the fact that you eat terung before eating rice…) He’s also an ‘environmental fighter’, campaigning for the protection of local rivers and forests. 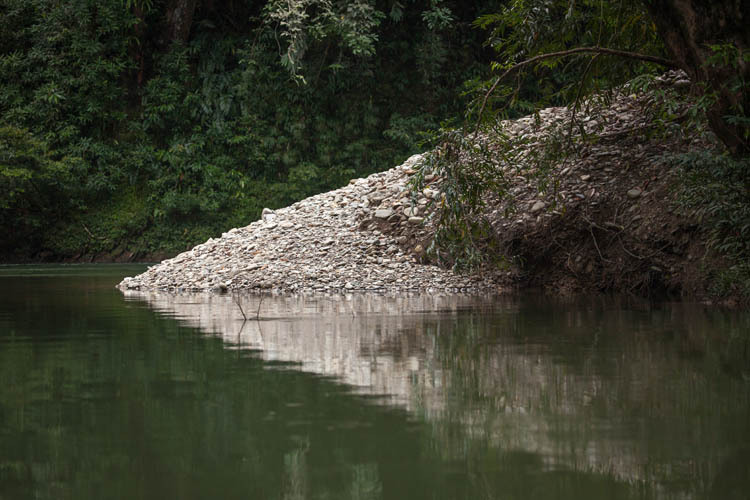 “If the rivers die, and the forest is gone, then Nature will become angry”. Karen got talking to a group of boys who brought out an English language book to show her. She started off trying to help them with their English, but it soon turned into a session of them teaching her Bahasa Indonesia, and laughing merrily when she made any mistakes. One of the boys later posed for this photo with his little sister. 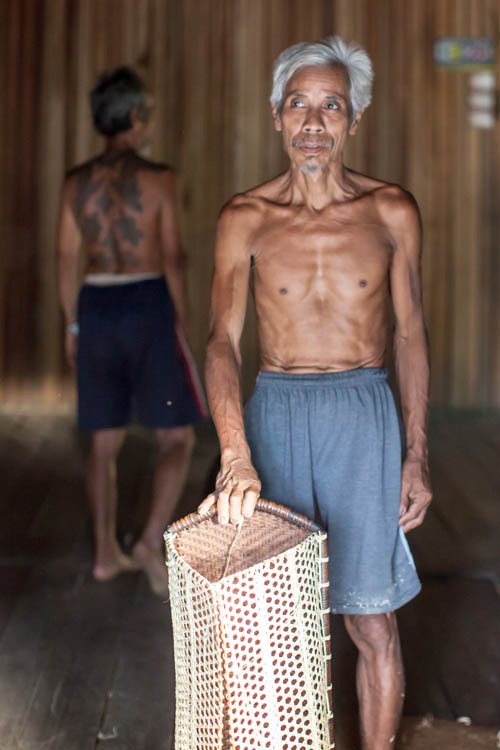 We watched this man finishing work on a basket he made from rattan cane collected in the forest. This style of high narrow basket is locally the standard used to carry goods. That’s Pak Bandi again in the background. 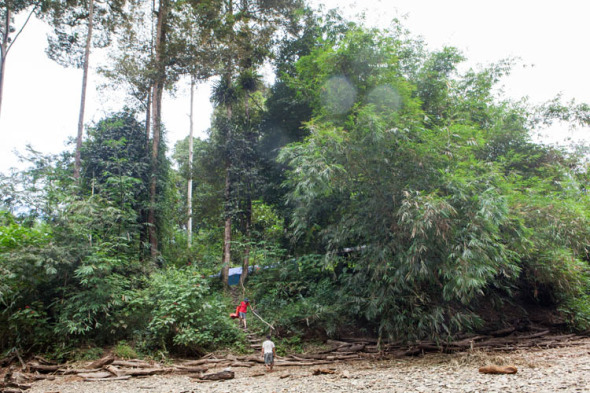 Eventually we assembled at Sadap village, the last settlement on the Embaloh River before the national park. Six of us (plus gear) piled into the longboat: us, our two guides Mustar and Syarief, and Madi and Jepri who were recruited from Sadap to crew the boat. 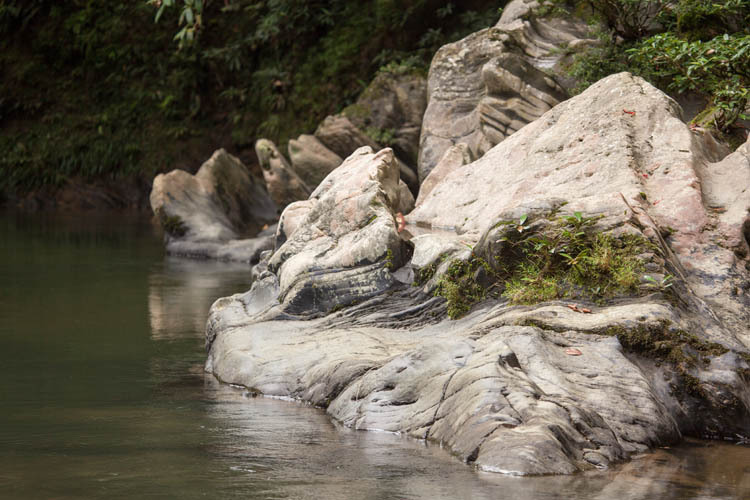 It needs two to get the boat upstream, where the water frequently runs only knee-deep over sharp rocks. One sits at the back and steers the (Yamaha) outboard motor, and one sits watchfully at the front, giving directions to avoid hazards, and helping to extricate us when we got snagged. We got to know them both quite well over the next few days. Madi is liberally tattooed in the traditional Dayak way, and filled with a restless energy that gives him only two speeds: busy and asleep. Whenever the boat slowed down enough, he would start fly fishing from the bow, and it was largely thanks to him that we ate fresh fish with every meal. He is still single, and keen to marry, but there is a shortage of unmarried women in the villages around Sadap. He was very interested to hear that in Canberra there are more women than men, and so we offered to ask around. Anyone? Jepri is more laid back. 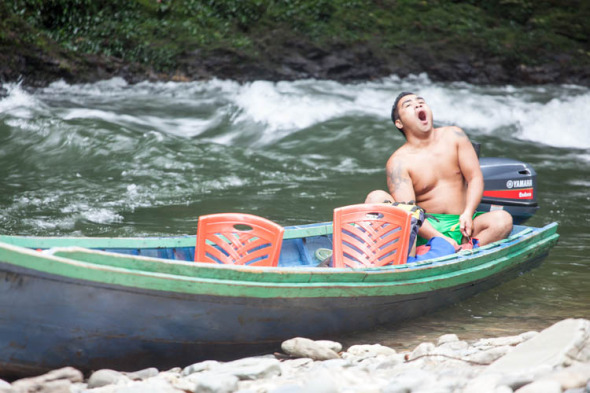 After getting us through some vigorous rapids and safely unloading us to shore, he sat back in the boat and … yawned. But, like Madi he is very productive. Apart from managing the transport, the two of them erected the tarpaulin shelter at our campsite, collected vegetables (fern tips and bamboo shoots) from the forest, then did all the cooking and washing up. Four hours upriver, and well past the last of the slash-and-burn gardens, we arrived at our campsite on tributary of the Embaloh River. A tent (for us) and a tarpaulin (for the other four) were quickly erected. It’s a little basic, with all ablutions in the river, but stunningly beautiful – and the best accommodation in the park. Hornbills and eagles flew overhead, and we woke in the mornings to the sounds of gibbons, the river, insects and a choir of songbirds. It’s still primary forest, undisturbed by logging, and quite beautiful. 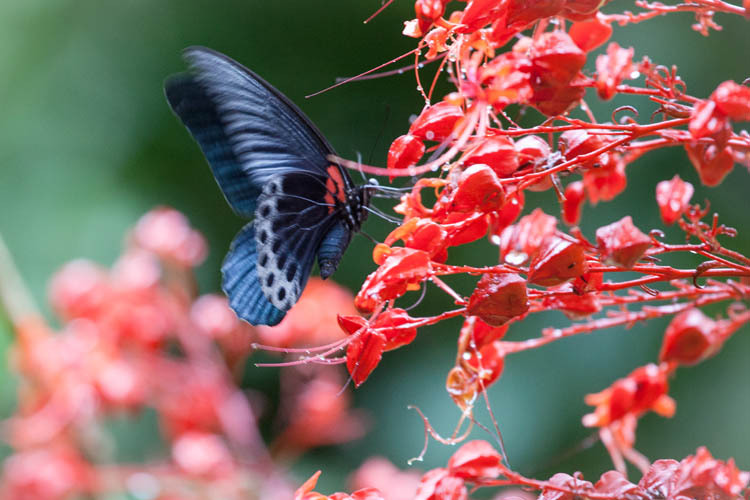 There’s a Jurassic Park feeling to it – everything seems bigger, crawling with life, weirder, and more… primeval. There are inch-long ants, creepers and lianas, vipers and pythons, and trees and palms with massive spikes along their trunks. To get to this waterfall, it was so very slippery that I CRAWLED up the rocks on the right. Madi RAN up the mossy log to show me how it could be done. The locals are so sure-footed traversing the muddy slippery steep and broken terrain. When we went hiking in the forest we felt so awkward, clumsy and ungainly, and always only a second away from falling over. We dripped with sweat all the time. They would look cool and relaxed, ambling along effortlessly. 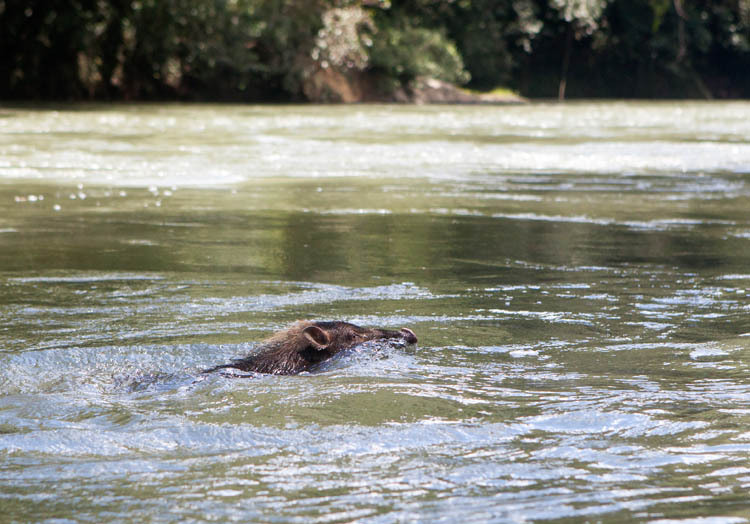 On our way back to Sadap in the longboat, there was a sudden commotion when Madi saw a group of five native pigs (babi hutan) swimming across the river. 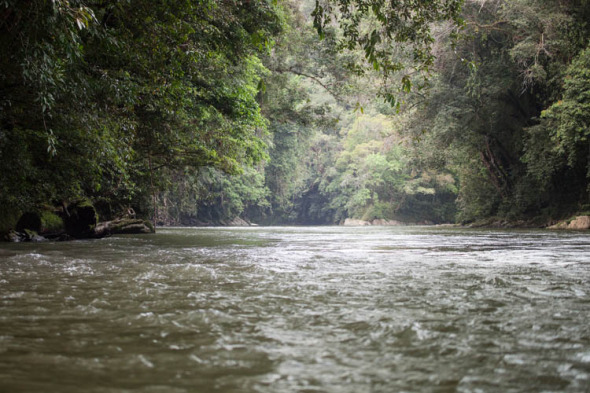 Without hesitation, he drew the mandau (the machete-like knife that all Dayak men carry at their waists) and launched himself into the river, slashing wildly into the midst of the very surprised pigs. He injured one, but didn’t kill it. He chased after them to the shore and ran barefoot up into the jungle after them, eventually returning empty-handed and very disappointed. Madi terbang (‘flying Madi’) became the joke for the rest of our journey back to Sadap village and ‘civilisation’. This entry was posted in General and tagged Betung-Kerihun National Park, Kalimantan Barat, Putussibau, Sadap, Sungai Utik, West Kalimantan. Bookmark the permalink. is not sadat village, but sadap anyways. Thanks anyways Ivan Prasetya, I’ll correct that typo now. 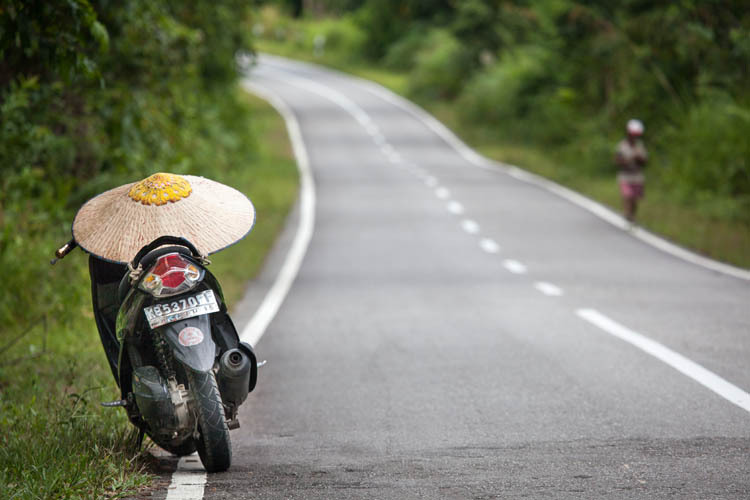 I didn’t put the village name into my GPS when we were there – only the nearby Betung Menua (and I hope that spelling is right…) And I hope you enjoyed the post.